Facelift + Fat Transfer = Glorious! In our November 8, 2011 blog post, we introduced Gloria, a long-time Dermess Medspa patient who wanted a little “refreshing” as she approached her 60th birthday. And in subsequent posts, we’ve introduced the Adivive fat transfer system as an alternative to other fillers, and discussed its effectiveness in skin rejuvenation. 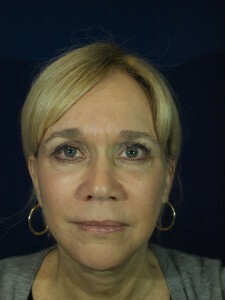 In early December, Dr. Marvel performed Gloria’s surgery – a combination of traditional facelift surgery and fat transfer. As you can see, the results are stunning! Dr. Marvel first performed liposuction on Gloria’s abdomen and waist (what a great perk!). He then used Adivive’s all-in-one, closed circuit integrated system to extract her fat cells for transfer. Adivive uses high G-force centrifugation and a unique, weighted filtering mechanism to “squeeze” the fat tissue, removing excess fluids and impurities. This process yields a higher-quality, concentrated fat tissue containing stem cells. When these cells are re-injected into the face, it looks more natural and offers longer-lasting volume retention. While traditional facelift surgery can tighten sagging skin, it can often leave the patient looking hollowed out in places where the underlying support tissue has diminished. The beauty of combining traditional facelift surgery with fat transfer is this: As the tissue beneath the skin begins to regenerate, the facial contours begin to fill in. When the “flaps” of Gloria’s face were open during her surgery, Dr. Marvel simply injected her own fat cells into the areas that needed filling, including her lips and cheeks. Today many of us drive hybrid cars, eat organic foods, and shop for beauty products that contain only safe ingredients. If given the choice, wouldn’t you want to fill your face with a substance that is purely you – with nothing foreign in it whatsoever? Especially when the results are so remarkable? Dr. Marvel thinks so. That’s why he’s one of the first cosmetic surgeons in Tennessee who is offering this procedure. If you’re considering cosmetic surgery, it’s definitely worth checking out. I Never Looked So Good! Read Gloria’s article and see the fabulous end results in the February Nfocus. This entry was posted on Monday, February 6th, 2012 at 5:14 pm	and is filed under Cosmetic Surgery, Fillers and Botox. You can follow any responses to this entry through the RSS 2.0 feed. You can skip to the end and leave a response. Pinging is currently not allowed.